The Hotel is just near the main visit sights and adjacent areas such as : Son My historical village, Thien An Mountain, Thach Nham original source sight seeing, Tay Son museum, Ly Son island district, Hoi An ancient streets, Han Mac Tu's grave, and especially the beaches: Sa Huynh, My Khe, Rang, etc...are holiday resorts attracting many domestic and foreign guests for relax, sight seeing reverence and sea bath. .
With an area of 6,000 m2, Central Hotel includes an nine storey building with nearly 90 modern equipped bed room. All rooms are equipped with morden equipment, complete information means, satellite system including various international program such as : CNBC, CNN, HBO, AUSTRALIA TV, MTV, TV5, ..Besides the Hotel also has "In house movie" system with many attractive entertainment programs. Separate transformer station, alternate generator insuring to supply electricity for the entire Hotel in case electricity from central network is turned off, etc. Big conference room with about more than 200 seats, besides that there are 2 small conference rooms having about 30 to 40 seats per one. 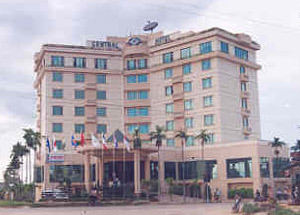 Those make Central Hotel become an ideal place for small and big meetings, conferences, seminar, wedding parties and various trading activities under many different forms. The Hotel also serves tranfers requirement of customers.